The battle for making the ‘smart home’ a central force in the development of frictionless shopping is on, and Amazon is determined to take home the spoils. It released its Echo device in the US last week, and talks this weekend about the company’s plans to launch its very own grocery delivery service, Amazon Fresh, in the UK as early as September, underscore the online retailer’s relentless endeavour to innovate. 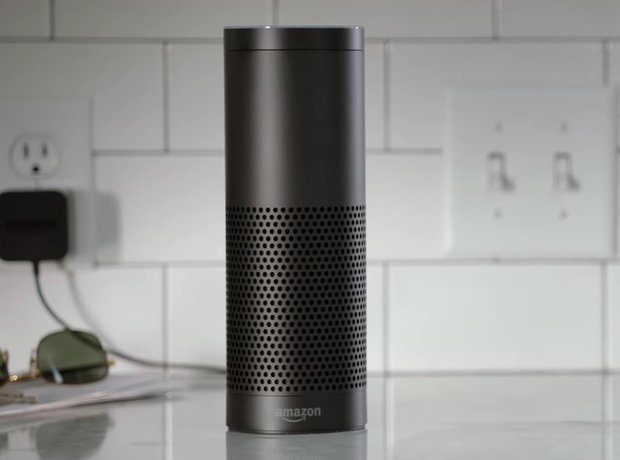 Amazon Echo at its heart is a device that sits on your shelf in the corner of your living room, office or kitchen, and then listens and reacts. You shout ‘Hey Alexa, play some classical music’, and the device fetches from music and fires up some tunes. You call ‘Hey Alexa, buy more Ambrosia Custard’, and it adds previously purchased items back into your shopping basket. I’ve had a brief play with one of the few units at a recent demonstration by the Amazon team, and I’ve been reading through some of the toolkits that Amazon is releasing to help developers and businesses add support for voice interfaces, and I’m very excited. Amazon realised a long time ago that e-commerce is an incredibly hard design challenge. You’ll never be able to mimic or match real-world retail environments, so it’s stopped trying, and is instead adding layers of shoppability to the real world. Voice control is maturing at a fast rate, and being able to shout that you’re out of tin foil whilst cooking, rather than scrabbling for that pen and paper, is a genuine leap forward in on-demand thinking. Match this with Amazon Prime Now - the recently introduced one-hour delivery service within London – and the soon to be launched Amazon Fresh, and the notion of effortless on-demand commerce is here. It heightens the importance of brand recall and preference; you’ll shout out the name of a brand you remember, rather than having a shelf of products competing for your attention with discounts and point of sale techniques, which they can rely upon. This also potentially cements the role of Amazon Echo in partnership with other media, especially TV - the ability to prompt purchase even if the audience isn’t second screening. However, fmcg brands will need to actively think what additional roles voice activated devices could play with other in-home internet of things interfaces. Whilst yes, it’s a direct opportunity to add products to online shopping baskets, thinking of voice as just another way of clicking ‘buy now’ is short-sighted. In the same way Google search data shows the interests and questions that audiences have around certain key words, and perhaps the content, which could be developed to answer that search - voice opens a new space in which to offer true value to consumers in their home. Will Vanish offer the answer of how to remove a stain within seconds of spilling a glass of red wine on the carpet? Can British Airways keep a wish list of places that the family is mulling over for its next holiday? Can Lurpak make a suggestion of a meal for tonight based upon the contents of the fridge? And that’s just playing with the idea of voice-based search, the most obvious first step towards using the platform. Amazon celebrated its 20th anniversary this month, and as an organisation, it is sitting on decades of insight and knowledge about consumers shopping habits and behaviours. What additional insights it’ll gather through having a new foothold in the front-room with the ability to capture more passing comments from consumers, rather active ‘sit and search’ type behaviours, will be of great interest to advertisers and fmcg brands. Operation London: is Amazon Fresh on its way to the UK? First Amazon Fresh rolled out in Seattle, before crawling across more US states. Then, last year, it pitched up in Germany.